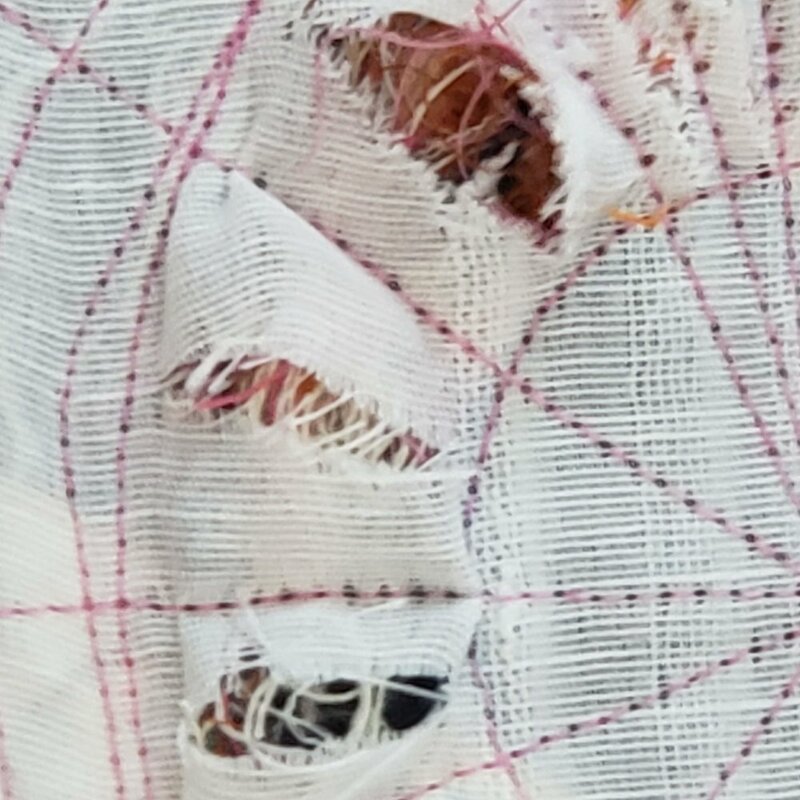 This small hole in a spot that won’t get too much abrasion seemed a perfect spot to test out a spiderweb stitch in rayon thread. We’ll see how it wears. For most of 2018 I’ve been participating in a group collage exercise. It’s modeled on the Karkhana Project of 2003, where 6 artists worked in discrete succession without preconceived plan. Sometimes the packaging of the artwork itself as it sped or, slogged, through the postal system became archeological as the artists layered paper and text over earlier packages. “Problem Child”, became extraordinarily dense and almost archeological in structure. Geographically the artists were in London, England; Pittsburg, Kansas; Los Angeles, California; and Alberta, Canada. As life intervened, some members had to move away from Los Angeles and the works traveled from LA to NY, to Vancouver, to Kansas, to Hawaii, to San Diego and to Alberta, Canada. 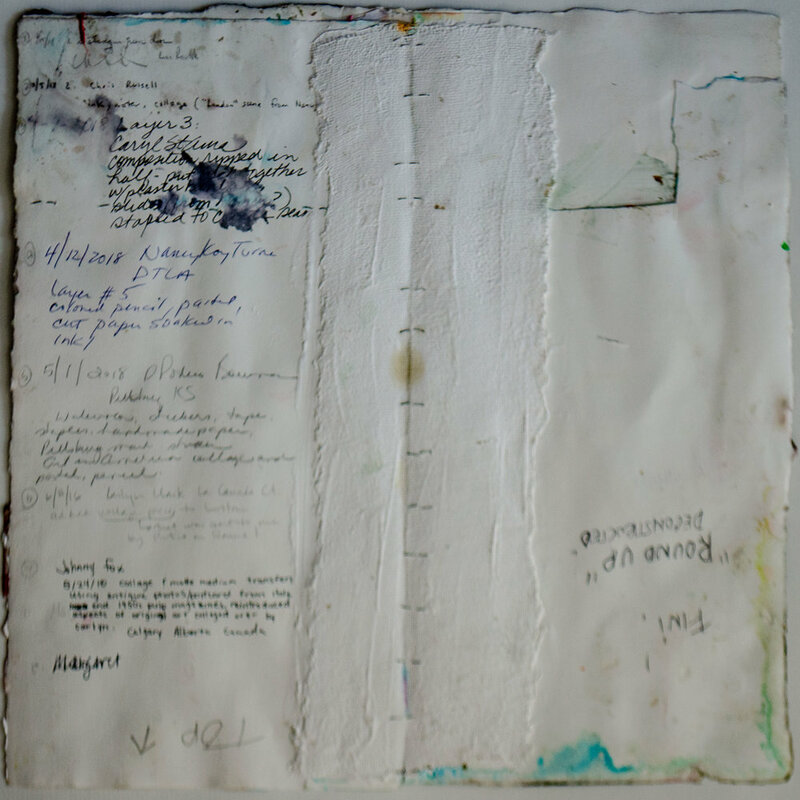 Before figuring out the structure of this project, Nancy Kay Turner and Margaret Lazzari collaborated on six works on paper casually mailing each work to each other with no particular timeline. These works went back and forth over a year. There was another Karkhana precursor with Caryl St. Ama, Carlyn Clark, Luke Reichle, S. Portico Bowman and Nancy Kay Turner. In that series (called “K1”), Portico did all the first layers and sent them out: therefore, this particular series had an internal compositional structure that easily became identifiable as landscape. “I found the process to be freeing”, concluded Margaret Lazzari. “I was almost never in control of what I received and almost never in control of the final product. Because of the lack of ownership, I took chances that I realize I should take more often with my own work…I found myself thinking more about form than meaning, and was willing to just let the meaning come through once the marks were made”. 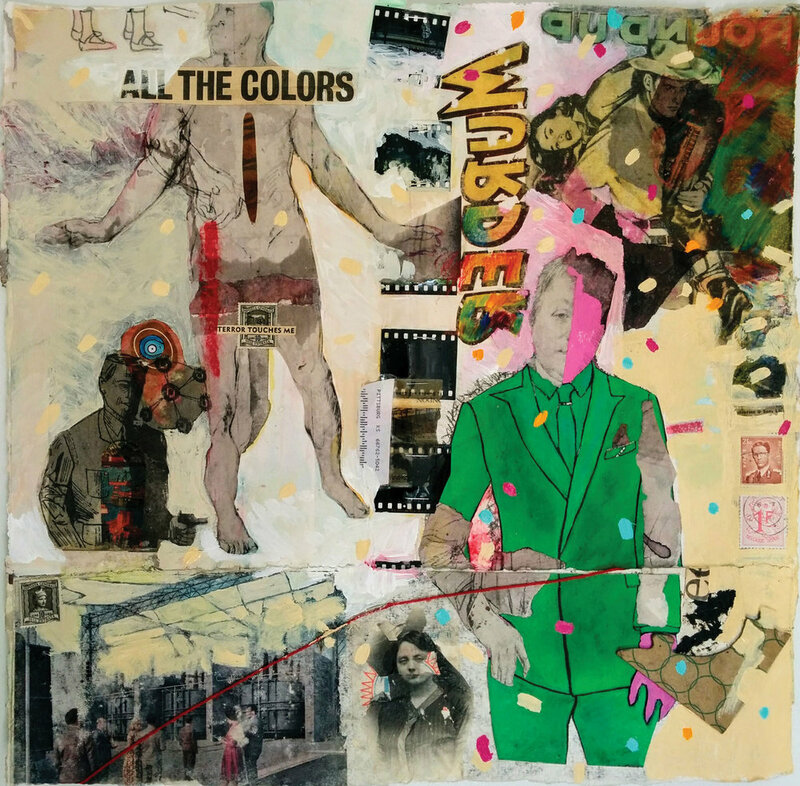 Some works, such as “See Father Pray”, clearly show each artist’s layer and decisions. In January 2018, a group of 8 artists, corralled and inspired by Nancy Kay Turner, began a new permutation of the project. Each artist created the first layer on two surfaces and then sent them on their way. Eventually everyone worked on all 16 pieces (though one went astray and was never found). 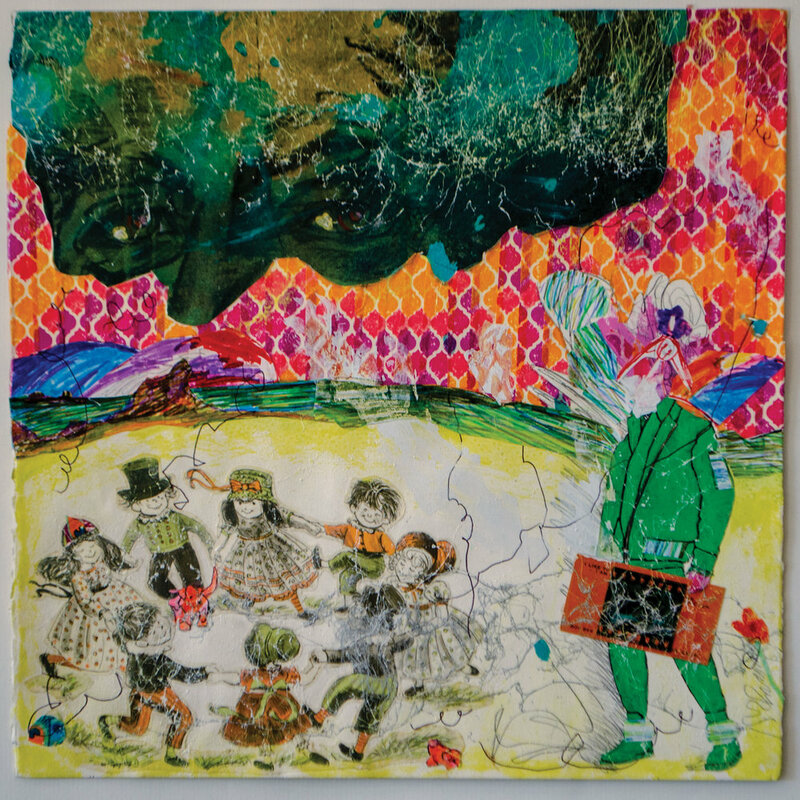 The artists were asked to participate because they were connected to someone in the group – either as a teacher, mentor, colleague or former student. 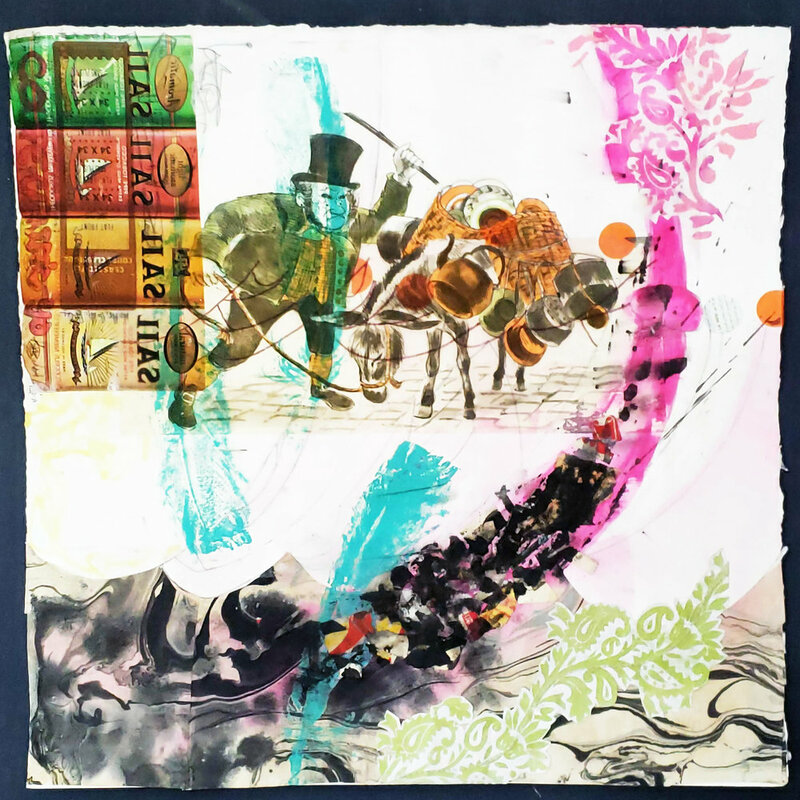 The artists chosen all have diverse art practices that encompass drawing, mixed -media, digital imagery, painting, and sculpture. The Karkhana model is particularly exciting in art-making today as artists across divides (gender, age, geography) can collaborate to produce artworks that are at one point in time uniquely theirs, but by the end of the process the works are completely hybrid. What was historically an actual physical workshop with many skilled workers in the same place became instead a loosely defined collaborative network. Each artist had a different response to the challenges posed with this new way of working. Johnny Fox noted, “I found the entire concept to be quite intriguing. Responding to the disparate approaches and contradictory styles each artist employed in order to create this body of work was immensely enjoyable and challenging”. “Karkhana collaboration is a space in which to drop pieces of myself. Traces of what I believed to be essential are covered over, or torn away and I’m forced to reconsider my attachments,” S. Portico Bowman. The orientation changed on some works as is evident on the paper trail on the back. “Round Up Deconstructed was spliced, flipped and put back together with plaster tape. Caryl St. Ama related, “I approached the Karkhana project with a bit of hesitation. I spent a long time looking at the work and finally developed a technique that worked for me by photographing each piece before working on it in Procreate on my Ipad”. Participants were allowed to erase, remove, or paint over earlier marks if necessary for the composition. 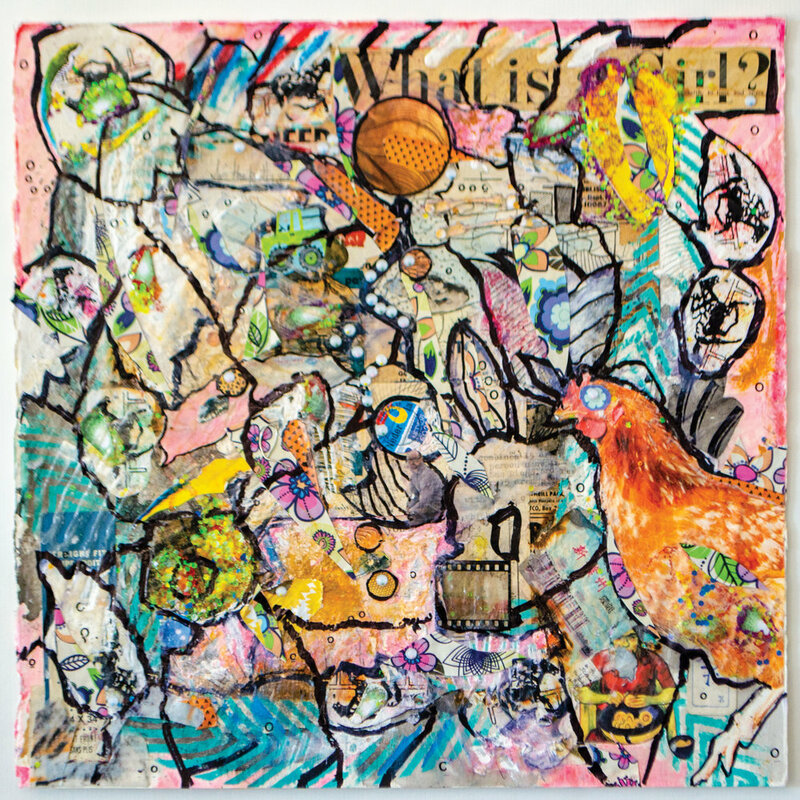 Each mixed-media piece has a diaristic element as every artist was instructed to write on the back and to note the date of arrival, and when they finished it, and of course, to sign the back. Some artists added notes about mood or a particular emotional trial they were going through. Artists were instructed to take a before and after picture of every work received and send it to S. Portico Bowman who created a website especially for this conceptual project. Please visit www.karkhanaproject.weebly.com to see the evolution and more, detailed images of the project. Many of the artists discussed how the process shifted considerably depending on which layer they were working on. “Customs, duties and brokerage fees…pricey. I did the final layer on Money Laundering. I tore the piece in half, taped it back together and added historical references to commerce from around the world. 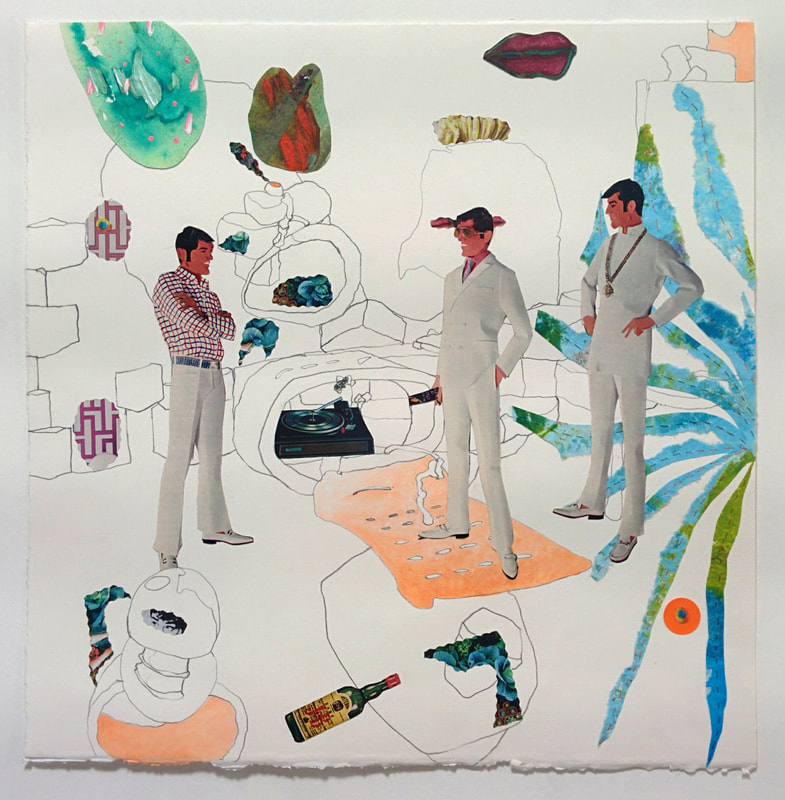 ”Men in White” after Margaret finished layer 4. Just like in real life, some pieces were easy to work on while others were nearly impossible or impassable. The creation of this conceptual body of work echoed a solo creative practice, which is filled with doubts, anxieties, exhilaration, surprise, fear, and ultimately joy. In the end, everyone came through. We already miss the chance to work together and are considering our next Karkhana collaboration. My scrap pile keeps getting smaller. I keep a jar next to my sewing machine and another one in my handstitching kit. As I clip threads I toss them in the jar. My original intent was just to keep the floor clean, but I became very intrigued with how it looked, so I got a big jar and kept filling it up. Today I was looking around for something to put underneath this sheer layer of fabric and stuffed some of the threads in. After slashing the top layer the threads are revealed and add texture, color and dimension. Continuing with my daily sketch, today I used random bits and bobs found at hand. Not much to look at, but the concept of making cloth from scraps of cloth is an interesting one. And the idea that the stitches attaching the scraps become the structure of the new cloth bears further exploration. Not sure where to go next with it. What Are All Those Stitches? A couple of years ago I was lucky to get a fancy new sewing machine. In the last couple of weeks I sat down and actually tried to learn how to use it! Most of my day-to-day sewing didn’t require any special knowledge. But I’ve been looking at all those stitches it could make and have never used. I had this bit of canvas I’d been using to playing around with painting stripes. Fairly uninteresting. So I picked a stitch and used it to create a little dialog with the stripes. Now I really want to know what all those stitches look like. I’ve been away from my work for months now. Rebuilding a house, carving out a workroom and figuring out how to effectively and efficiently set up a dye workspace. But summer is over, the house is mostly habitable (though my workroom is a work in progress) and it’s time to get back to work somehow. I’m so discombobulated that I can’t even figure out where to start, so I decided to just pick up the closest things I found and do something. Anything. Just get the cobwebs loosened up a bit. Staying small. Not giving it any importance or significance. Don’t want to startle myself! After trying many, many planners and systems I came upon the bullet journal system and love it. I use an inexpensive composition book which looks a bit tatty after time. 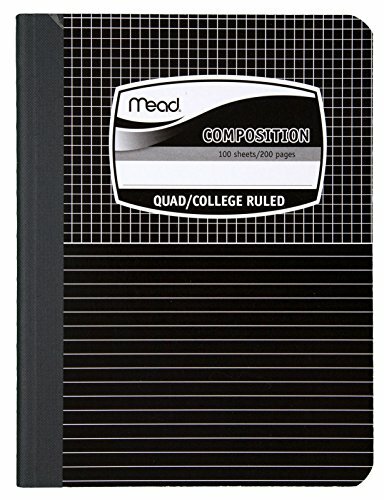 That got me started using composition books for just about everything. I have one in the kitchen I use for recipes, one that's a dye journal, one for quilting projects, one for stitchery projects and one for actual journaling. I flipped through my stack of fat quarters and covered the journals. Then added some machine stitching. I'm not embarrassed by my books any longer! I'll also share a great composition book I found on Amazon that's perfect for design work. It's got a grid on the top half of the page and lines below. It's perfect for quilting design so that you can sketch above and then do all the calculations and notes below. Highly recommended!